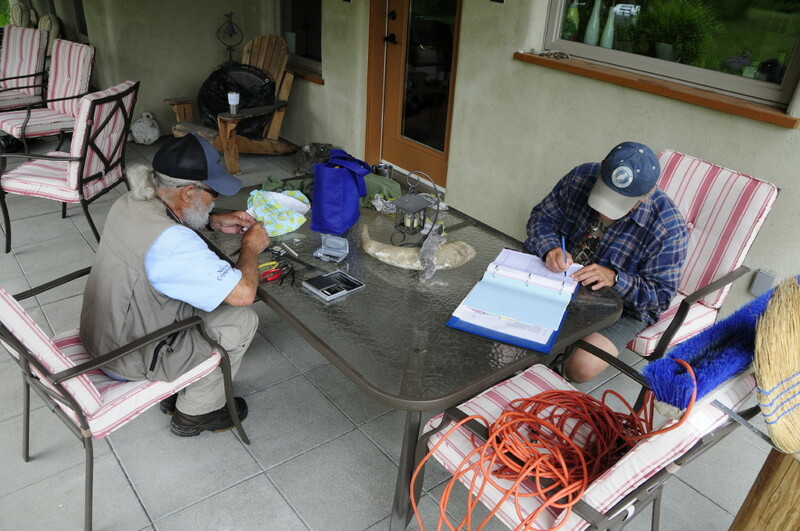 Barry Lancaster and his capable assistant, Rick Howie, were here this week for Barry’s annual spring banding session. 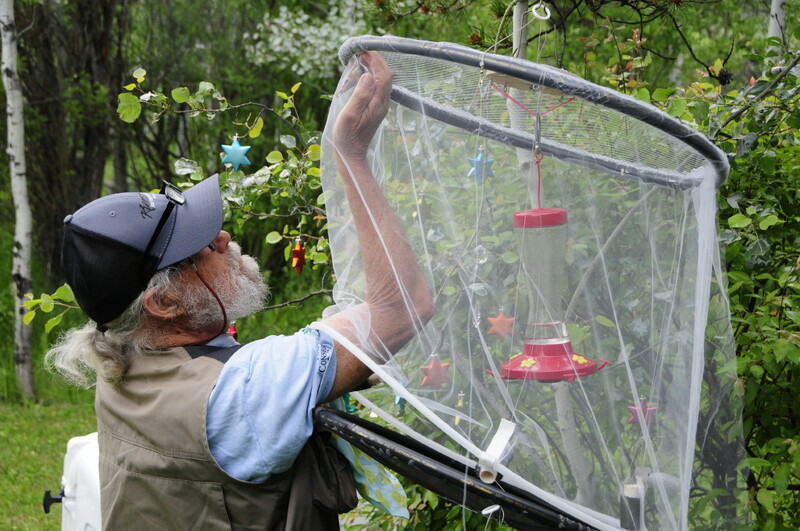 Each morning Barry opened nine nets at the Tatlayoko Lake Bird Observatory station and caught a diverse mix of bird species but in relatively low numbers. Rick and Barry also observed Sandhill Cranes and Curlews in the pastures adjacent to the station. Both of these species sightings are exciting because they are new to the valley since 2014. 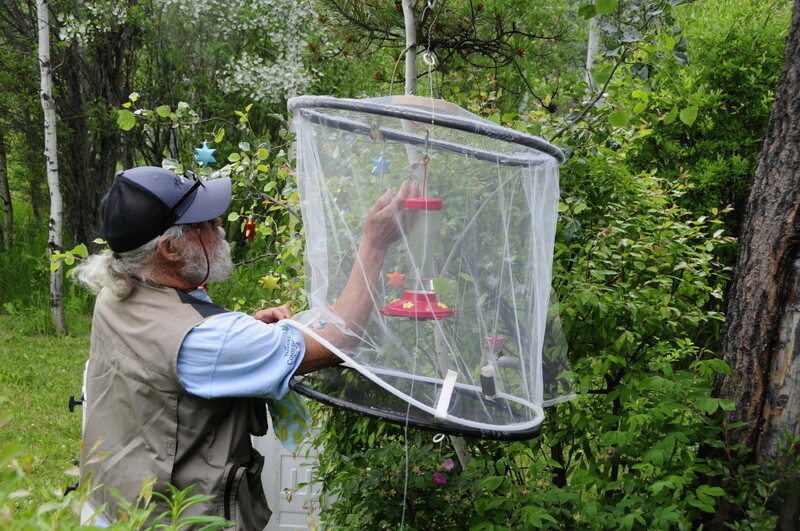 But what I want to blog about today is the afternoons that Barry and Rick spent on my patio trapping hummingbirds at the feeder. While relaxing under cover in a cedar deck chair the ‘trapper’ patiently waits for a hummer to come for a sugary quaff. The feeder is hanging within a few feet. His hand lightly holds the string that is used to release the trap. When a hummer arrives, with a quick practiced motion of the hand the trap is sprung. I understand that once you catch on to the technique it is almost 100% catch rate. 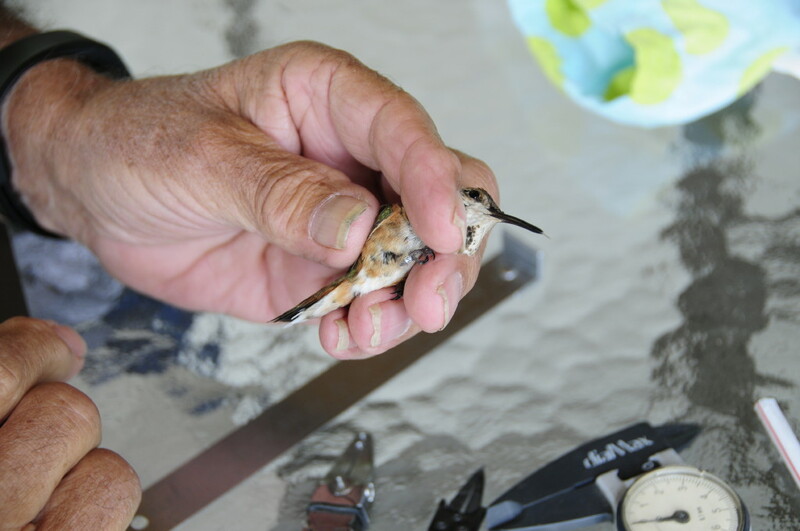 In four afternoons, Barry banded 27 hummers of two species and both genders, Calliope and Rufous, without a single recapture. I was amazed at this number! It must mean there are far more hummers around than I would have guessed; Barry estimated up to 90 birds in the vicinity. Barry and Rick set up their ‘banding station’ on my patio table. 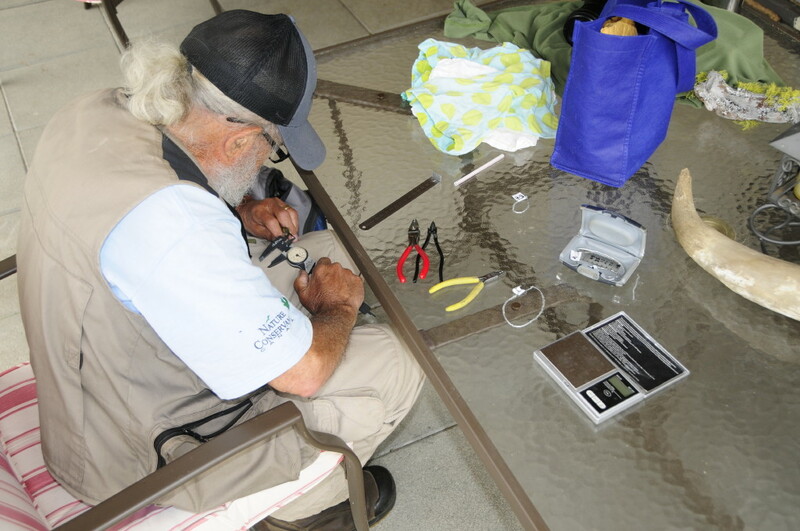 Temporary banding station at the patio table. 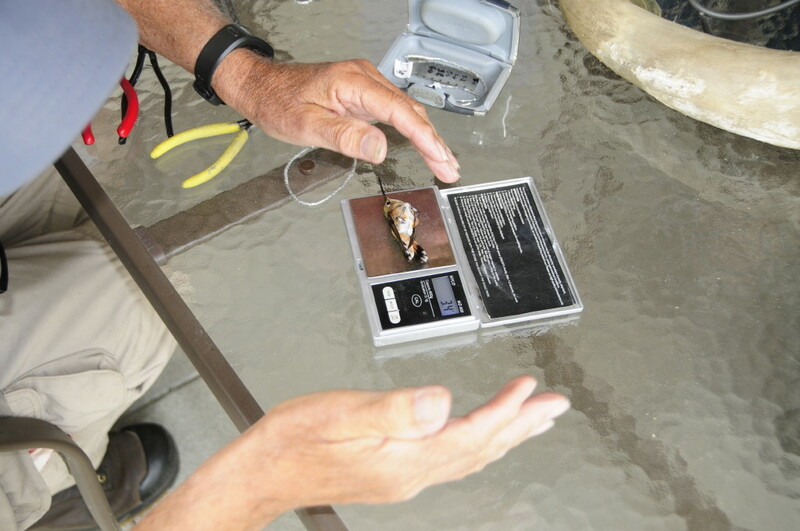 Barry processes the bird and calls out the data while Rick records it. 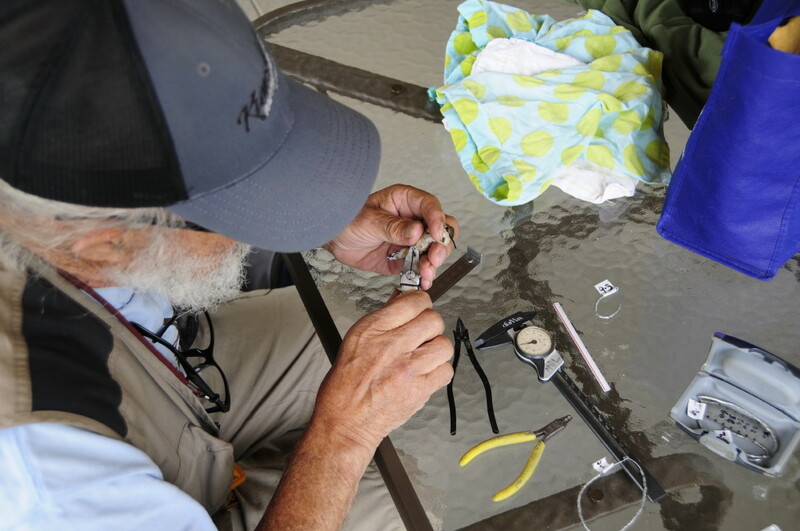 Attaching the tiny band, which Barry forms by hand. Apparently, if you lay the bird on its back it will not fly away. Wow, only 3.4 grams… and that includes the band. 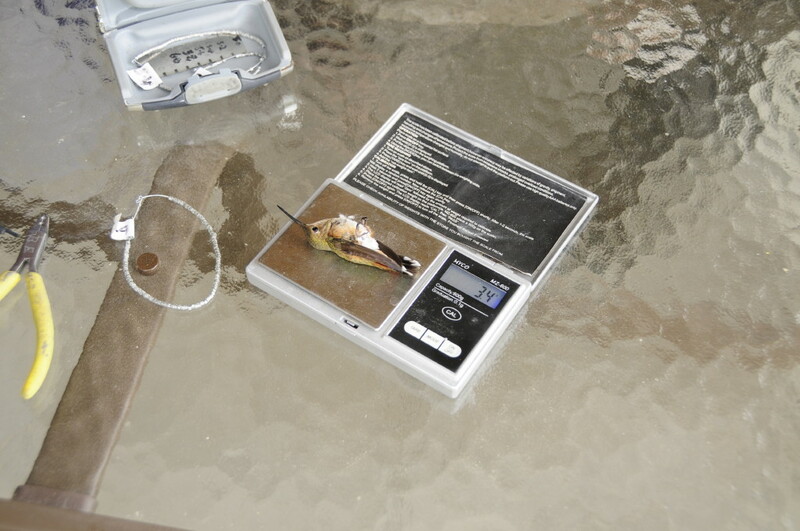 I understand that some species of hummers weigh even less than this. 5:30am, 24 May 2015, dawn breaking over Big Creek Marsh at the base of the Long Point penninsula in southern Ontario. As I spent the first minutes of my Birdathon atop the viewing platform the chorus of marsh birds was in full swing. A distant American Bittern galunking, Marsh Wrens and Red-winged Blackbirds singing up a storm and my only Virginia Rail of the day giving a couple short calls before full light hit. Next stop was Backus Woods, on the mainland, famous as one of the only known breeding locations for Prothonotary Warbler in Canada. The chorus of birdsong was still strong as I rolled up to my first quick stop, a stakeout for Blue-winged Warbler. As soon as I stopped I could hear the male giving it’s “Bee-buzzzzz” song, a drumming Ruffed Grouse was a bonus pick up. Onwards to the main part of Backus where, as I walked in to “Prothon pond”, Scarlet Tanagers called overhead and numerous Wood Thrush and Veery sang their ethereal songs. After fifteen minutes birding around the pond I finally heard the male Prothonotary Warbler singing along the backside of it, too distant to get a look at unfortunately. A Yellow-throated Vireo and Blackpoll Warbler were both good finds as I waited, neither of which I recorded again. Back out along Consession 4 road, I tried in vain for the Louisiana Waterthrush that we had heard the day before. Nearby I did find singing Pine and Hooded Warblers. It was almost 8am by the time I left Backus, a bit behind the rough schedule I had set myself. 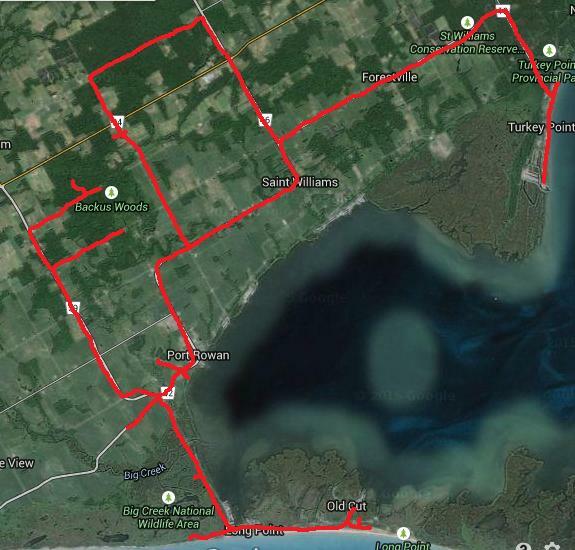 As I headed back out to Long Point, a pair of Black Terns flew overhead along the causeway. Before arriving at the Old cut field station of the Long Point Bird Observatory, I took a quick detour along the shore down Hastings drive. A group of 8 Bonaparte’s Gulls were slowly making their way west, a good find this late May. Unfortunately I didn’t have a scope with me so a few distant blobs out on the water had to remain unidentified. Upon arrival at Old Cut my list sat at 70 species. Activity seemed to be the highest it had been since I had arrived a few days before, a good sign! A Green Heron flew overhead as I made my way into the Woodlot and I could hear a Grey-cheeked Thrush and Yellow-bellied Flycatcher calling. Several species of warbler were about with American Redstart, Tennessee, Magnolia and a late Black-throated Green Warbler, amongst others, all present. A quick jaunt down Lighthouse Crescent proved a good decision as I found a Black-billed Cuckoo skulking in the undergrowth. My last stop of the morning was the “Old” Provincial Park, just down the road from Old Cut where I hoped to reach the 100 species mark before noon. A small island of shrubbery held my only Mourning Warbler of the day along with my first Wilson’s Warbler and a brilliant male Canada Warbler. Philadelphia and Red-eyed Vireos sang overhead, and somewhere in the distance I could hear an Eastern Towhee. A lone Cedar Waxwing flew overhead as I made my way back to our cottage for a quick bite to eat with my list at 97 species. Morgan, my girlfriend, was heading over to Turkey Point for lunch with her family who were visiting for the afternoon and I decided to accompany them. On the way they picked out a Red-tailed Hawk for me, soaring overhead and we saw several Turkey Vultures. In the restaurant parking lot I picked out my 100th species of the day, a Northern Rough-winged Swallow. While they enjoyed the lakeside breeze and soaked up the sun on the restaurant patio I took their car, which they had very kindly offered me, out for a quick search along the beach for some shorebirds. The beach was rather crowded with people, and I came away empty handed, although a group of actively feeding Common Terns was a nice spectacle to watch. For the afternoon I was accompanied by a friend, Jesse Pakkala and our first stop was the Turkey Point Conservation Area where he took me to a Louisiana Waterthrush stakeout. With this local specialty ion the bag we detoured through the nearby St. William’s conservation Area as we made our way back towards Long Point. The mid-afternoon doldrums were in effect as bird song was rather light. We did pick up a couple Ovenbirds, which had been my nemesis for the day up until then. The East Quarterline Sparrow fields were our next stop and here too, the hoped for targets were quiet, we did find Field and Vesper Sparrows but missed out on the hoped for Grasshopper and Clay-colored Sparrows. 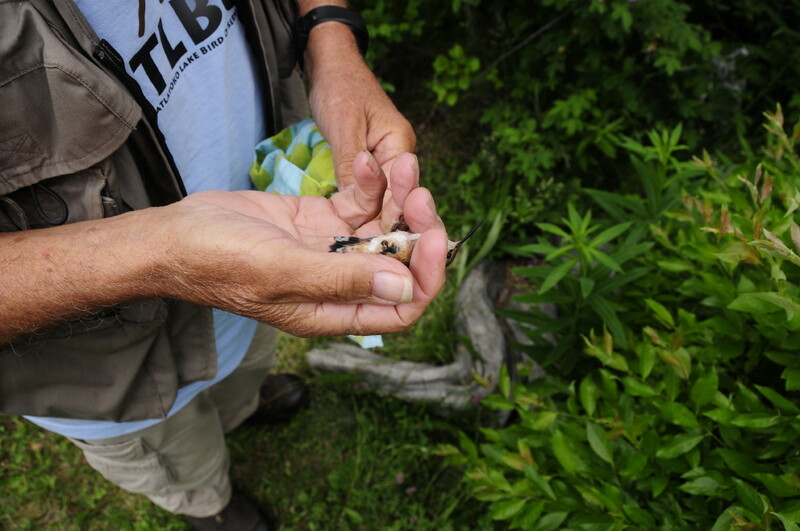 As Jesse had to be back at Old cut by 5:30 the last hour of the afternoon was a whirlwind with 20 minutes at the Bird Studies Canada Headquarters providing 4 species of waterfowl on the bay and a nesting Least Bittern. A fruitless stop at the puddle along Lakeshore road that had had a pair of vagrant White-faced Ibis up until the day before was followed by a Savannah Sparrow on a nearby fencepost and another quick pass down Hastings Drive. Back at Old Cut Jesse showed me a roosting Common Nighthawk that had been found earlier that morning and I squeezed out another new bird in a female Cape May Warbler. On the way back to the cottage I took another look through the “Old” Provincial Park where I finally caught up with a Chimney Swift and came across the bird of the day, an Olive-sided Flycatcher, fly-catching from a wire right across from our cottage! As I sat down to dinner my list stood at 115 species. Afterwards a few of us spent the remaining daylight on the dyke back at Old Cut. Angry twittering of the local Tree Swallows alerted me to a Cooper’s Hawk cruising overhead and the final bird of the day was an American Woodcock that buzzed by in the fading light. Final species total for my 2015 Birdathon: 117. If you are interested in contributing to my Birdathon, please select the following link. 75% of proceeds will go towards TLBO with the remaining 25% going to Bird Studies Canada. Donations are tax deductable and can be made until the end of the calendar year.